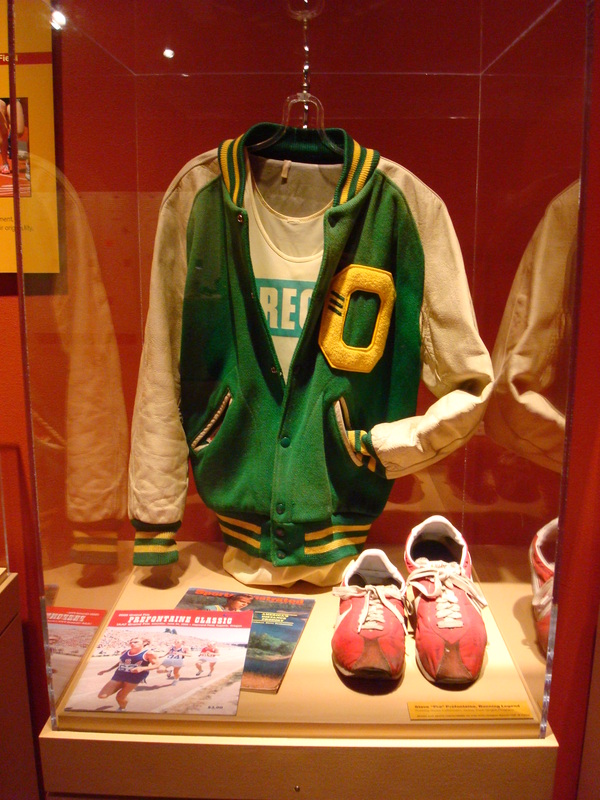 A few weeks ago I wrote about my journey to Oregon to explore the legend of Steve Prefontaine. While most of my ramblings here tend to focus on mindless Hollywood drivel (let me not downplay the importance of said drivel, of course) sometimes there are instances that warrant a more in-depth look. Some of you may have wondered why The Movie Mind is writing what may potentially be construed as a legitimate article…something fit for a real-life journalist, or at least one of the many hacks that moonlight as one. For those that know me it should be transparent that I lack any motive to become what some call a “journalist”. It should become quite clear why I have taken this cross-country trek, spending 16 hours of coach-class flight time, a dozen hours of rental car driving, and 3 nights in cost-friendly accommodations. Aside from the fact that not nearly enough of you people click on my links and ads to allow me to travel first-class, the real reason has everything to do with a man called “Pre”. He was a man who exceeded his record-breaking personal accomplishments by becoming a cultural phenomenon and icon. This was the type of man who embodied what sport and entertainment should be about. It takes a special story and an even more meaningful person for Hollywood to manage not to screw it up like they do so often. This is my account of what Pre was all about and why some guy who likes to talk about himself in some weird third-person alter-ego called The Movie Mind felt the need to tell that story. 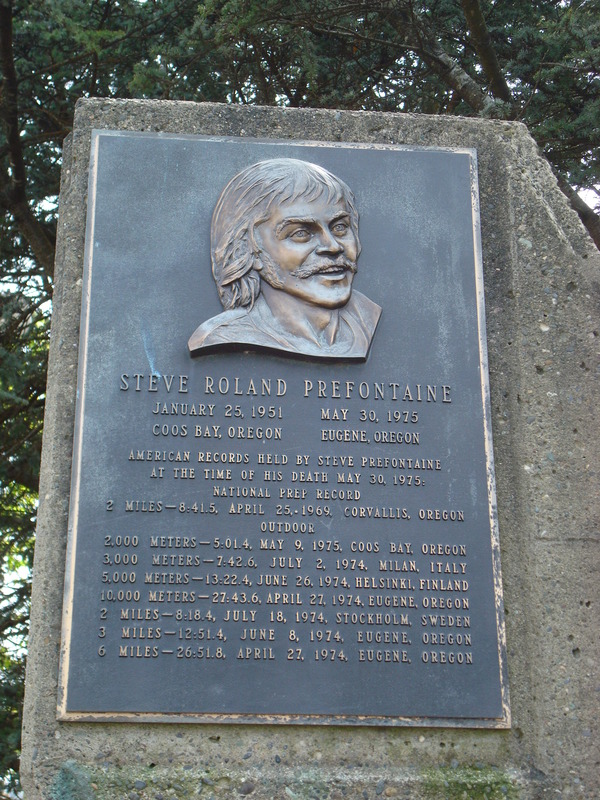 Oregon is a big state, yet not too vast to overshadow the lasting legend of Steve Roland Prefontaine. I’m pretty sure running has always been a huge pastime of most Oregonians (seeing as how Eugene bears the nickname “Tracktown USA”; and how legendary U of O track coach Bill Hayward coached there from 1904 to 1947), but it seems as if Steve Prefontaine brought it to a whole different level. He took running into the mainstream and turned it into a contest that relied more on heart and guts than talent and athletic ability. Maybe it was a combination of his charisma and the mystique of the 70’s, but he was more effective at getting people to look past his otherworldly ability and solely on his grit and determination than any other athlete I have seen. It is what endeared him to so many fans, and frustrated so many competitors. His brash style was more of an affirmation of his talent and will than in-your-face showmanship. It was not trash-talk, it was merely stating the facts of the contest. He said, “I want to make this a pure guts race because in the end, I know I am the only one who can win it”, which was more a statement of truth than a put-down to his competitors. Upon entering Eugene and as The University of Oregon campus sneaks up on you, it is easy to see why this is the home of so many legendary runners. I couldn’t find better scenery and more moderate weather to accommodate a runner. The biggest question-mark I took away from the atmosphere of Eugene is wondering how anyone there stayed motivated. Let’s just say there are more “incense” stores and solo guitarists strumming “Kumbaya” on the campus lawns than most other campuses around. Still, the laid back feel creates an even better setting for the nature of a runner. 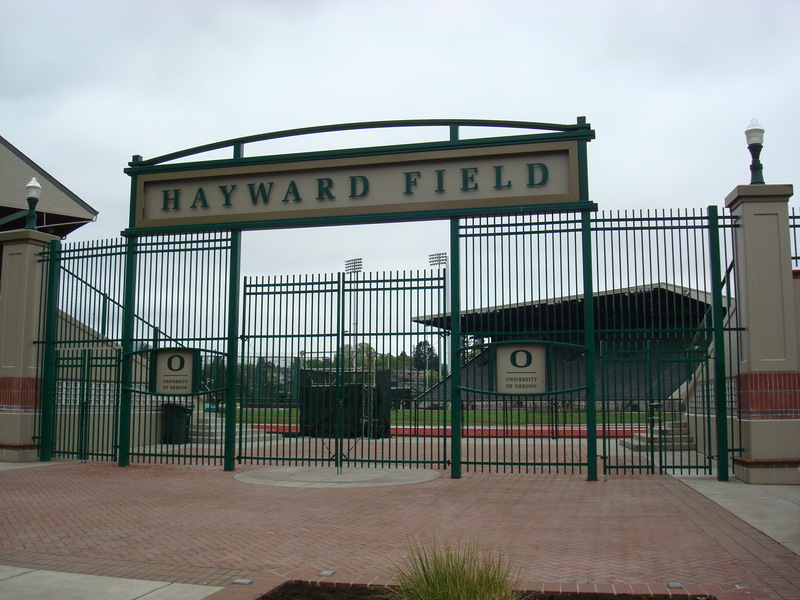 It was quite easy to find Hayward Field. Without knowing the actual layout of the campus I can say that all roads led to the famed track. It was an incredible feeling, just walking up to the giant entrance gates that rival some of the largest football stadiums. 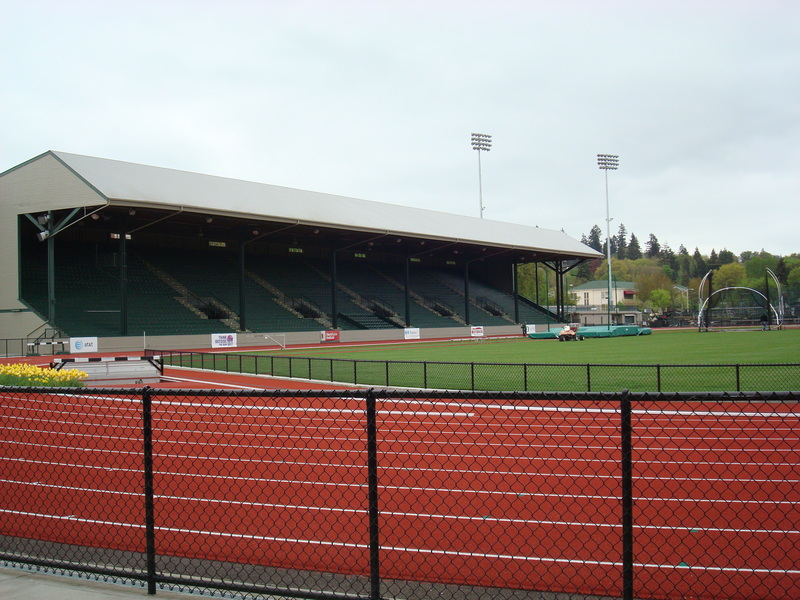 It helps the larger-than-life image of this field that it used to be where the Duck Gridders played, but I still can’t imagine another track stadium rivaling the scope and aura of this one. I felt just like I did as a kid seeing Yankee Stadium for the first time…such a grand place with so much history inside those walls. 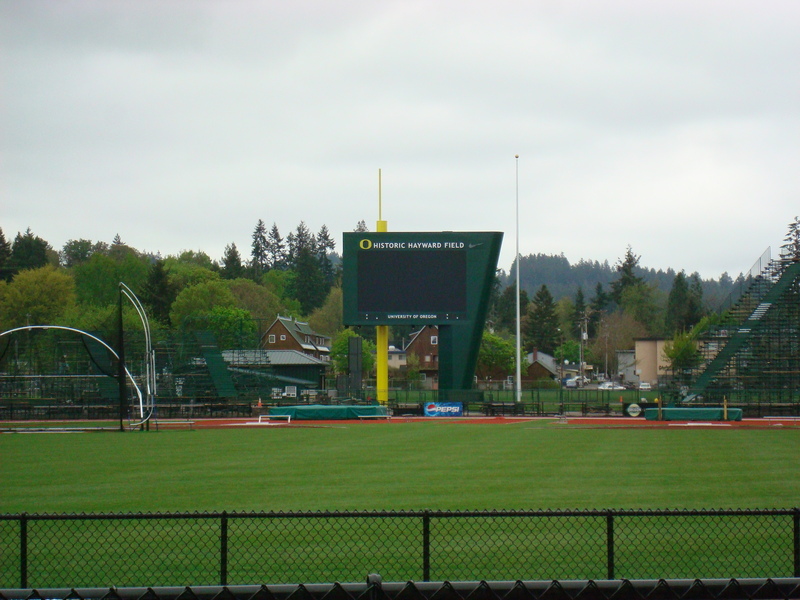 It doesn’t take long to relive the history of the field, as life-size pictures and biographies of three of the biggest U of O track luminaries adorn the front entrance. Bill Hayward, Bill Bowerman, and Steve Prefontaine appear on the walls as a track-mural to the greatest of all-time. 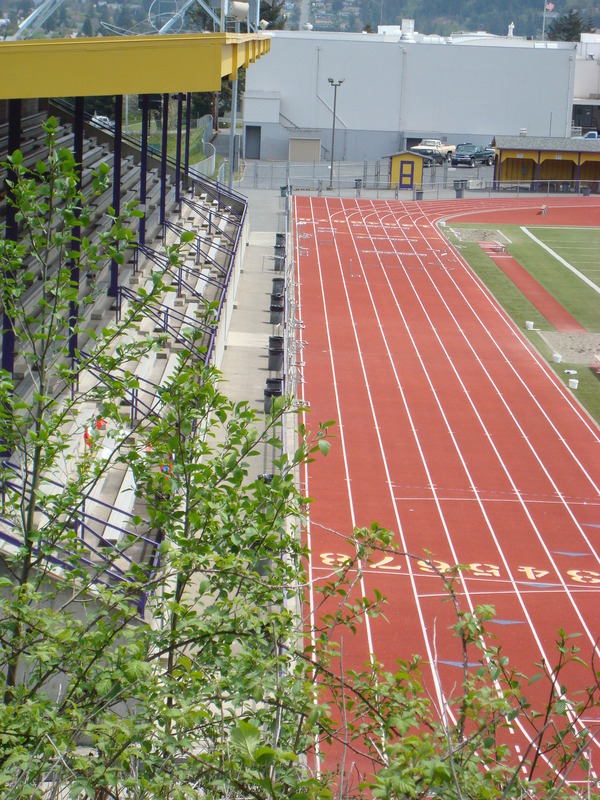 Unfortunately, the track was closed because they are undergoing renovations to be ready in time for the Olympic trials heading to that very spot in only another month. I didn’t feel quite as bad as Clark Griswald pulling up to Wally World only to be mocked by Wally the Moose informing him about the park’s closure, but I did feel slightly deflated. Only of course, until I walked around to a service gate and waltzed right inside. Looking at the stands you can picture a packed house chanting “Pre, Pre, Pre” as he set sights on yet another world record. 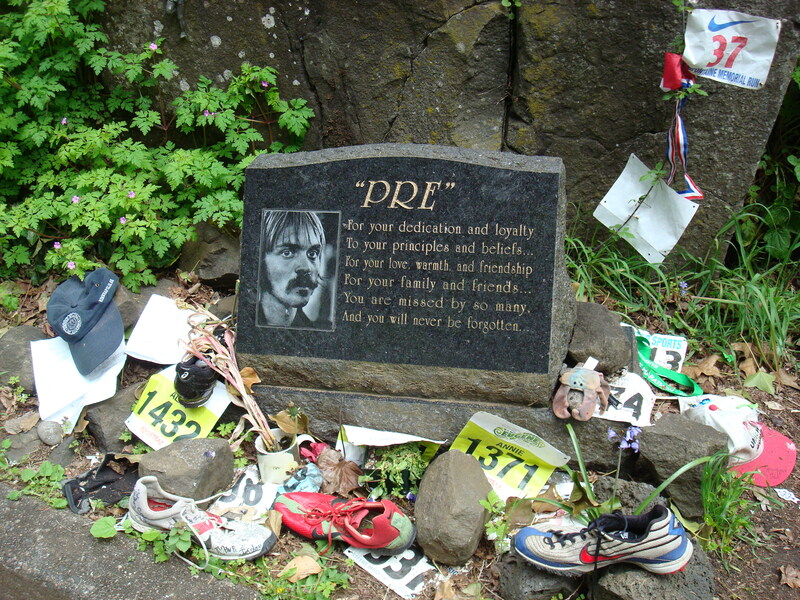 It was at “Pre’s Rock”, the site of Prefontaine’s car-crash and untimely death, where I really began to understand what this man meant to his community. I had seen pictures of his rock, and knew that people frequently traveled there to leave mementos and keepsakes, but I had no idea to what extent. Besides the track shoes, and singlets, and race numbers, and pictures, there were a number of hand-written notes from fans and fellow runners that had been placed there within days as they showed no sign of weather. Reading these notes from afar I was able to get an amazing sense of how much this man meant and still means to his fellow runners. It was an altogether amazing, eerie, and somber experience that I will never forget. I finished up the Eugene experience with a quick trip to the Ducks Bookstore, to add to my Prefontaine memorabilia. It is incredible to think that all these years later the bookstore still has a large section devoted to the legend of Pre. The two-hour drive from Eugene to Coos Bay took us to the famed Oregon coast and further south past some vast sand dunes and gorgeous beaches. 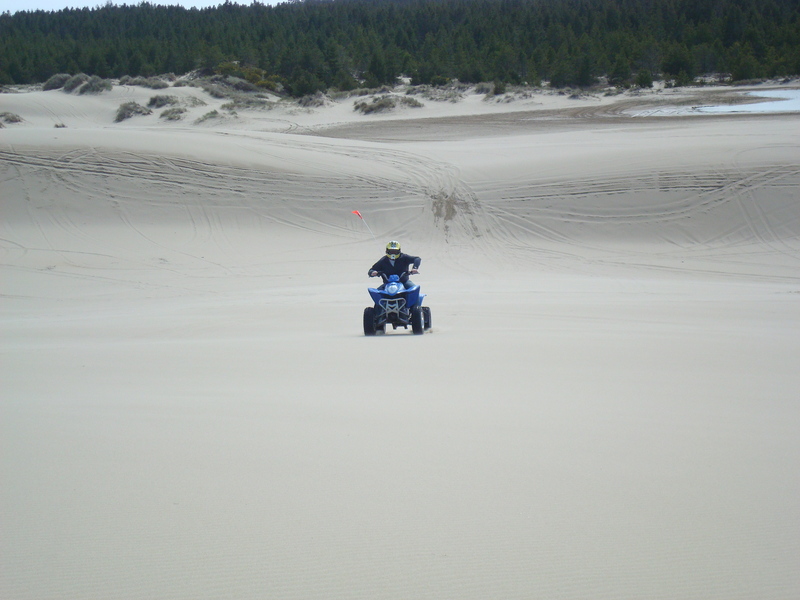 Looking at these intimidating dunes (and having driven an ATV through them) you could see where Pre most likely went to increase his speed and stamina. After an incredibly fun pit-stop, I headed into the small town that was once the lumber capital of the country. According to the locals, the only lumber trade left is shipping off wood chips overseas. Either way, you can still appreciate the scale of what was once a thriving industry. Of course if you want a better appreciation of the Oregon lumber trade, look no further than the History Channel’s Ax-Men series. As for Coos Bay, as we pulled into town you started to get an appreciation for Pre’s roots and determination. 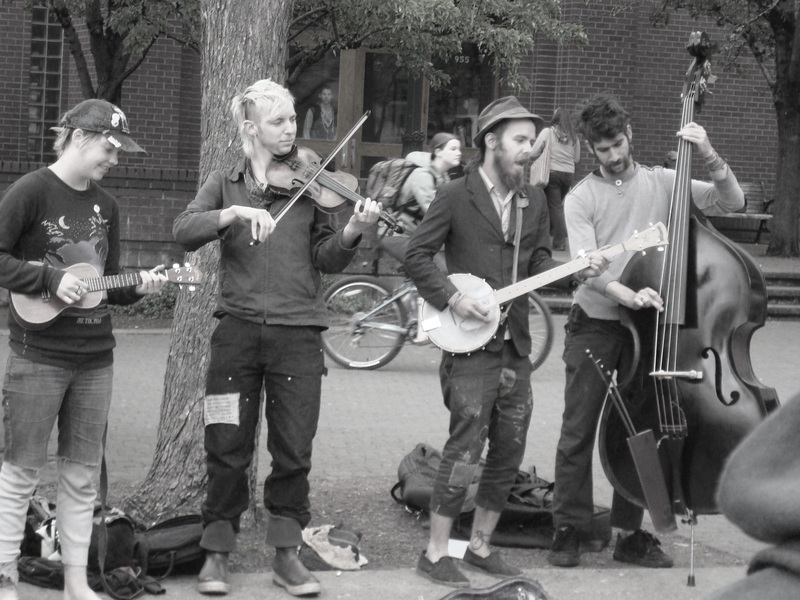 While it was a great tourist experience on the whole, it is certainly more modest than its counterpart, Eugene. The funny thing is, this is where I was able to gain a truer understanding of what Pre meant to a community who loved him. 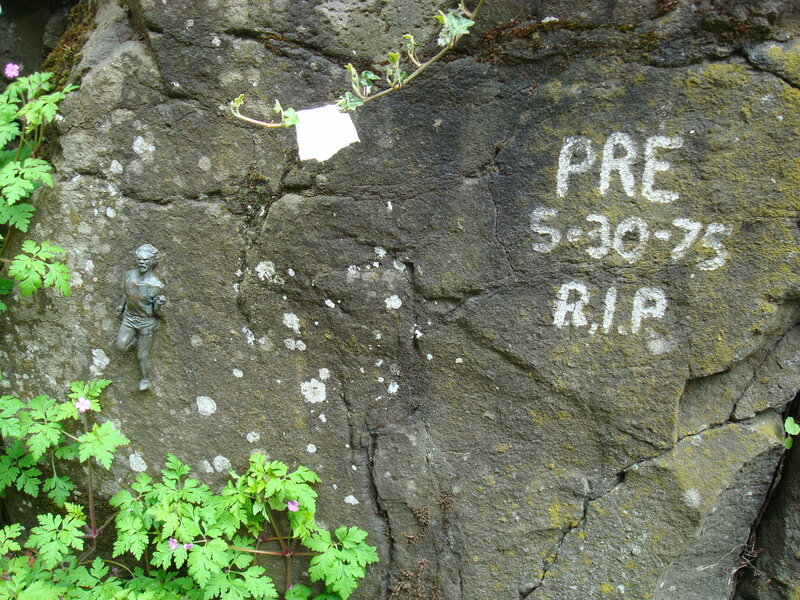 In Eugene, the legend of Pre is certainly alive and well. In contrast, the people and community of Coos Bay still seem to be mourning the loss of a great person who happened to be a great runner, and not the other way around. From the friendly townsfolk who are happy to talk about their old friend who ran against him in high school (or with him) to the others who simply remember a good guy named Steve from Coos Bay, all seemed surprised to hear that this guy would travel all the way out there just to learn about where Pre came from. Walt was modest about his own feats, although one should probably pay a certain level of respect to a man who ran for both Bill Hayward and Bill Bowerman at U of O. Interesting enough, he says he does not go up to Eugene very often anymore and most questions I asked about Bowerman and the Ducks were greeted somewhat tenuously. He doesn’t visit Pre’s Rock because of how difficult it would be to see, but he does pay his respects at the gravesite in Coos Bay from time to time. I felt that I should leave the gravesite out of the trip because it is a place of privacy for close friends and family. Walt was a terrific window into the soul of those who were close to Pre. He embodies the community of Coos Bay and should probably receive more credit than he gets both for his role in Pre’s achievements, and the increasing growth of the Coos Bay running program and its brand new high-tech track. After talking to Walt, I headed over to Huggins Insurance where they sell some more great Prefontaine memorabilia that you can’t get anywhere else. Bob Huggins was a former teammate of Pre and heads up the Prefontaine Memorial Committee. Another incredible sign of Pre’s lasting legacy is how you could walk into a full-service insurance agency during mid-day on a Thursday and meet people so helpful and friendly when you have zero interest in talking life-insurance. 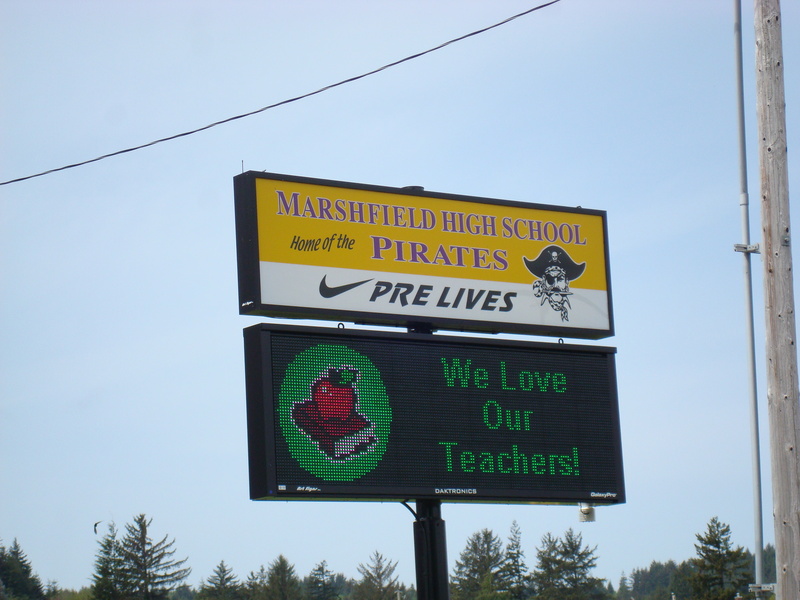 There you can pick up signed artwork of Pre (by the artist or even his parents), a plaque holding a piece of Marshfield high’s old track Pre ran on, or some shirts from past Prefontaine Memorial runs. Most of all you can get people eager to help you and an owner in Bob Huggins who is still willing to chat about his old buddy. I took away a different experience than I thought I would from this trip, better than what was my original concept. I experienced both facets of Pre’s running career; where he came from and where he went. There are many so living testaments to his legacy, that it is comforting to know what he stood for and what made him “Pre” will still live on. While he has two feature length films about his life, I would push people like me who wanted to know more about the man to dig deeper. The films are a good way to get you intrigued and want more, but the deeper you go the more you will find what is inspiring. Pre wasn’t just a world-class one-in-a-million runner; it is what made him great that is so inspiring. As I was fortunate to learn on my journey, Pre the person was just as incredible as Pre the runner. Read Tom Jordan’s book for a look into the career accomplishments, and read Bree Donovan’s book (http://stores.lulu.com/breetdonovan), co-written by Pre’s sister Linda, which is a fictional story geared towards children but certainly can offer up some great insights into Pre’s life you can’t get anywhere else. For some one-of-a-kind memorabilia, you should check out: (http://www.prefontainerun.com). Finally, if you are looking to plan a Prefontaine Journey of your own, please contact the helpful people at the Coos Bay – North Bend Visitor & Convention Bureau (www.OregonsAdventureCoast.com). Katherine Hoppe or one of her colleagues will be more than happy to help you plan your own special Pre trip. So glad you enjoyed your trip! The people of Coos Bay are amazing. It’s so obvious that Pre’s relationships were of mutual respect and love. Thanks for buying the book and the plug! My wife and I enjoyed a “Pre Pilgramidge” June 6-12, 2008. Eugene, Hayward, Coos Bay, Dunes, Pre Classic, Pre’s Rock, ect…Great experience…it just felt good to finally run where Pre ran and see what Pre saw, and be where he was. Unforgettable…thank you for your insight into this great man.